Throughout history we see that in every generation God has been faithful to bring revival to His people and spiritual awakening to entire nations. In almost every one of these cases, these movements of the Spirit were evidenced most strongly among young people. Many young Christian leaders sense another awakening stirring among young people and there are encouraging signs of revival as God’s Spirit moves in fresh ways among them. It is quite possible that we stand on the cusp of the greatest revival and awakening in all of history. Do you desire to see a dynamic demonstration of the Holy Spirit’s power in our generation and in the lives of young people in your life? If we truly desire to see this mighty move arise among our students and emerging leaders, we should seek the Father, through prayer on their behalf. 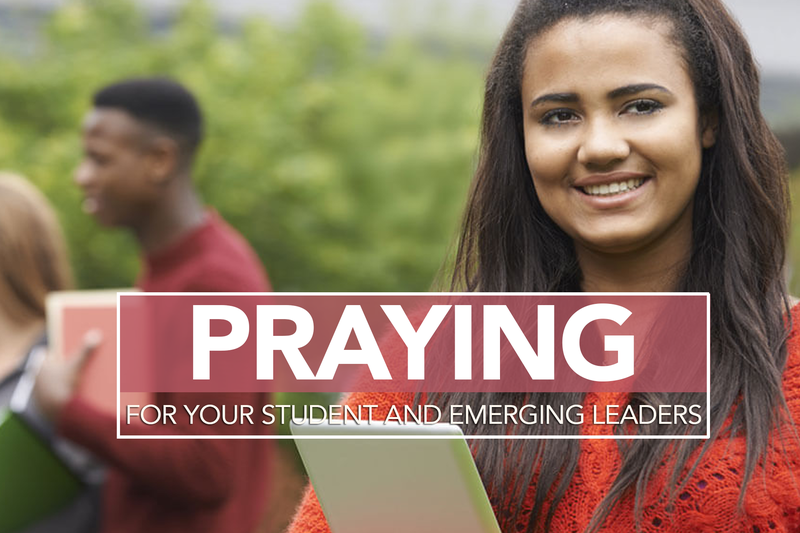 Throughout this month, we will unite our prayers to pray specifically for the students in our lives—covering each area of their life in specific ways. We invite you to call out the specific names of the young people in your life as you pray through the directives below. Thank the Father for His loving care of young leaders in your life and for the plans He has for them. Ask Him to give them a divine passion and passion for living (Jeremiah 29:11, Psalm 139:13–16, 2 Corinthians 5:20, Jeremiah 1:5, John 14:13, Romans 8:28, 29). Pray for wisdom in their choosing of friends and that God will bring people into their lives who will point them to Christ and encourage them as fully-devoted disciples (1 Corinthians 15:33, Hebrews 10:25, 1 Thessalonians 5:11, 1 Samuel 16:7). Ask the Father to transform the mind of your student so that they are renewed and He is honored through their speech, love, faith, and purity (1 Timothy 4:12, Romans 12:1, 2, Psalm 24:4). Ask the Father to birth a hunger for righteousness in the relationships of your student and that they would recognize the lies of the enemy. Ask God to strengthen them to enable them to flee sexual immorality and remain pure until married (John 8:32, 1 Peter 1:5, Hebrews 13:4, 1 Corinthians 6:18, 1 John 4:4, James 1:12–14). Ask God to grant an anointing of extraordinary power of the Holy Spirit in the life of your student so that he/she will be a great witness for Christ (Acts 1:8, Luke 4:18, 19, 1 Peter 3:15, Matthew 28:19, 20, Galatians 5:24). Ask the Father to give your student help to view money as a resource for Kingdom purposes. Ask that they be granted contentment whether in possession of plenty or poor (Philippians 4:19, Matthew 6:24, Ecclesiastes 5:10, Hebrews 13:5; 1 Timothy 6:10). Pray that your student would submit to Christ as well as those in authority over them. Ask for an extra measure of grace to love, respect, and honor their parents, teachers, spiritual leaders, and government officials (Ephesians 6:2, 3; Hebrews 13:17, Mark 12:17). Ask God to nurture the soil of the heart of your student so that they have greater sensitivity to the things of the Spirit and grow in their knowledge of His ways (Luke 2:52, Galatians 2:20, 2 Corinthians 5:17, Ephesians 3:16). Ask for a knowledge of the truth of God and spiritual eyes to see so that the enemy would not be able to deceive them (1 Timothy 3:9, 2 Corinthians 2:11, John 17:17, Ephesians 6:14). Pray to the Father that He would fill your student with the hope of the resurrection of Jesus Christ and protect his/her mind and heart from hopelessness (Galatians 6:9, Ephesians 6:13, Philippians 4:8, 2 Timothy 2:13, Hebrews 10:23, 1 Peter 5:8, 9).